So Christmas and its usual schmaltz is upon us. Miracle on 34th Street and The Polar Express have, of course, been showing on Channel 5 since early September, but today marks the day in the film calendar. Forget The Force Awakens (tour de force that it was) and ponder, for a moment, the magnificence of It’s a Wonderful Life, screened across the world this special day. Yes, my favourite film of all time, too often dismissed as sentimental drivel. Far from it. Frank Capra’s masterpiece is, quite simply, one of the most complex, devastating critiques of America, enriched by an ethic which is both Christian and socially conscious, and manages to pull off the Christmas feel good factor. In effect, the plot of It’s a Wonderful Life is quite simple, an intriguing inversion of A Christmas Carol. Where Scrooge is shown all his wickedness both in the present and in the future, good man George Bailey (James Stewart) is shown how awful life in small town Bedford Falls would have been had he not lived. George, like Scrooge, is in finance. But while Scrooge has amassed his wealth for personal gain, George has put his efforts into the Buildings and Loan, a small company dedicated to helping ordinary citizens have a decent living. Life for George has been a series of missed opportunities. While his younger brother Harry has had all the breaks and is a celebrated war hero, George has slogged away, often at considerable personal cost. Missing college, excused war service on account of deafness in one ear, George continues to live in a half finished home. His kids drive him mad and small town America is far from idyllic, being dominated by mean minded capitalists, embodied in Henry F. Potter, the evil banker doing his best to put opponents out of business. On Christmas Eve, George is suicidal. A mistake by an employee, exacerbated by Potter’s plotting, means that the Building and Loan is verging on collapse. Half drunk, George ponders leaping into the torrents of an icy river. It’s then that the difficult part for cynics of the film happens – an angel rescues him. Forget some kind of muscular St Michael defeating the forces of evil. This is Clarence, fat, bubbly, none too successful himself. But it’s this comic turn which helps preserve the Christmas spirit to the film and provides a neat narrative device, for it enables the film to show an alternative reality… What if George had never lived? Cut to an alternative Bedford Falls, renamed Pottersville. Without George’s selfless humanity, his wife has never married, an old man is in jail, the honest but hard working poor in squalor and the town itself overrun with casinos, strip joints and pawnshops. Capra does not shirk from seeing the darkness out there. 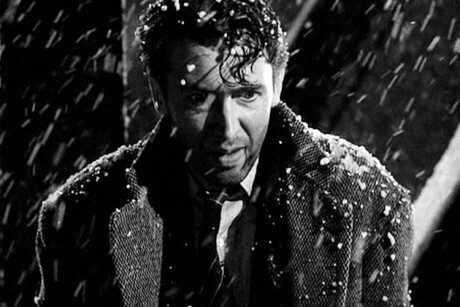 Indeed, It’s a Wonderful Life has been read as one of the darkest films of all time. Yet George realises the need to go on living, whatever the cost. George has done some good. And his own family – however much they drive him wild – really are worth it. More importantly, his own town is worth it. Fans often point to some particularly strong performances, most notably from James Stewart. Just watch Jimmy Stewart in moments of despair, where his eyes alone reveal an extraordinary level of pain and confusion. And in places it’s wonderfully comic. At a high school dance, the movable gym floor famously opens mid party, throwing the revellers into the swimming pool below (apparently this happened at Beverley Hills High School). And despite being made in a Californian heat wave, it’s hard to think of a film which so evocatively creates a sense of a genuine white Christmas. But it’s above all a film with grit to it. Bailey versus Potter is David versus Goliath. At once personal ethics of selflessness, service and sacrifice are celebrated and public politics critiqued. Big corporations ruin lives. Greed destroys communities. Communities themselves are never idyllic. In fact, small town life can be brutally oppressive. If the American Dream is of personal fulfilment, then it’s never to be found in Bedford Falls. Unless, of course, personal fulfilment is paradoxically found in service to others. By the end, however, It’s a Wonderful Life transcends politics. Gathering around the Christmas tree, saints and sinners alike begin to sing ‘Hark! The herald angels sing’. Just at the line in which ‘God and sinners’ are ‘reconciled’ some of the evil bankers even cough up their own cash to save the Building and Loan; the religion of this film is about action. Grinning, holding back the tears (by this stage I’m ‘ swallowing hard’ if not actually weeping) George recognises the value of his life, of his family, of the town he has shaped. All might be redeemed. Cynics will sneer at its plot and sophisticates mock its insistence – in spite of everything – on the value of selflessness. 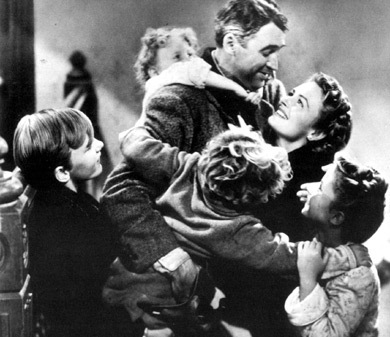 But fairy tale or parable for a capitalist era, It’s a Wonderful Life gets to the heart of Christmas in which the Word becomes flesh and love in action is revealed, even in the darkest of times.